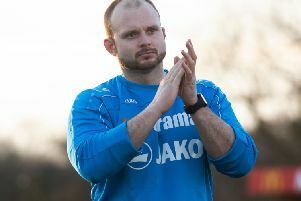 Hemel Town are beginning to feel that the refereeing gods are conspiring against them after falling to a 2-1 defeat at the hands of struggling Concord Rangers at Vauxhall Road on Saturday. Again the Tudors felt harshly done by as Ed Oshodi was controversially sent off for the second week running, after official Justin Amey deemed he had fouled Ben Greenhalgh in the box on 30 minutes. The video replay showed Oshodi made little or no contact with the Concord forward, but Amey felt there had been a foul and a penalty was given – with the unfortunate Hemel player heading for a another early bath. Steve Cawley stepped up and fired home the spot kick, despite Jamie Butler going the right way. Until this point the game had been fairly even, with both sides having half chances, without really testing either keeper. On 36 minutes Concord made the most of their advantage to go two up, when Greenhalgh pounced on an error in Hemel’s depleted back line, tucking the ball past Butler’s despairing dive. Jamie Slabber came on at the start of the second half as the home side made their intentions clear, but a physical rear guard action by Concord saw their efforts frustrated. Oliver Hawkins felt he was getting some robust attention from Rangers’ central pairing but got little sympathy from the referee. A late free-kick from Ben Herd evaded everyone and ended up in the back of the net to reduce the arrears, but it was too little too late and the Beach Boys hung on to gain their first win in seven games. Hemel Hempstead Town: 1: Jamie Butler 2: Ben Herd 3: Kyle Connolly (14: Terrell Forbes) 4: Matty Harriott (15: Josh Hill) 5: Ed Oshodi 6: Wilfred Gnahore (12: Jamie Slabber) 7: James Potton © 8: Jack Smith 9: Oliver Hawkins 10: Noor Husin 11: Jamal Lowe. Subs not used: 16 Mo Shariff 17: Xavier Comas Leon. Concord Rangers: 1: Ben McNamara 2: Tom Stephen 3: Arthur Lee 4: Jay Dowie 5: Steve King 6: Adam Bailey-Dennis 7: Lewis Taafe (12: Max Cornhill) 8: James White © 9: Ben Greenhalgh 10: Steve Cawley 11: Joe Gardner (16: Sam Bantick) Subs not used 14 : Nathan Fox 15: Bertie Brayley 17: James Hammond.